Olivier Award-winning company Mischief Theatre continue their West End takeover with a brand new improvised show at London’s Arts Theatre, dedicated to the glitz and glamour of Hollywood. Based on their smash-hit Edinburgh Fringe favourite Lights! Camera! Improvise, Mischief Movie Night is the blockbuster comedy that promises to be completely unpredictable. From the creators of The Play That Goes Wrong, Peter Pan Goes Wrong and The Comedy About a Bank Robbery, Mischief Theatre guarantee a night of hilarity as they attempt to produce an improvised movie live on stage, with the help of a fast-paced band and technical team. Using suggestions from the audience to determine genre, location and title, a new movie will be created each night, featuring rewinds, fast forwards, directors’ cuts and deleted scenes. Casting sees several of the original Mischief members return to the West End, including Josh Elliot as Not Sure, Dave Hearn as Uncertain, Harry Kershaw as No Idea, Henry Lewis as Don’t Know Yet, Ellie Morris as Couldn’t Tell You, Charlie Russell as TBC, Jonathan Sayer as Who Knows and Henry Shields as Guess Who. Produced by Kenny Wax Ltd, the production features Showstopper! Adam Meggido as improvisation consultant, as well as design by Tony Award-winner Nigel Hook and lighting by David Howe. Onstage musicians are Chris Ash and Richard Baker. 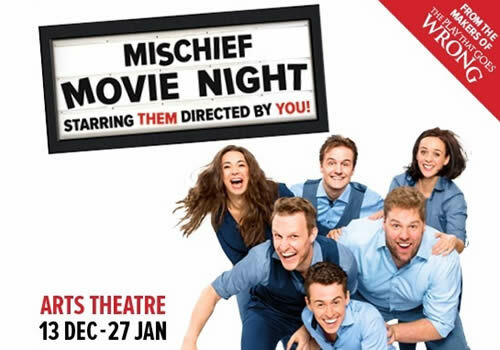 Celebrating their 10th anniversary as a company, Mischief Theatre is the award-winning group that recently conquered Broadway with their smash-hit The Play That Goes Wrong. With successful productions across the world, the theatre troupe return to their West End roots, playing a limited festive season at the Arts Theatre. Mischief Movie Night plays at the London venue from December 13th 2017 to January 27th 2018. Mischief Movie Night is a 12A.